The Balouchi people are a group of nomads whose villages span the areas of eastern Iran, southern Afghanistan and western Pakistan, where this tribe of villagers have flourished despite centuries of migration and exposure to wars. Though they are currently well-established on these lands, their history of wandering the desert locales has played a significant role in the artisanship of Balouch rug weaving, best exemplified in their production of smaller iterations of Persian rugs. 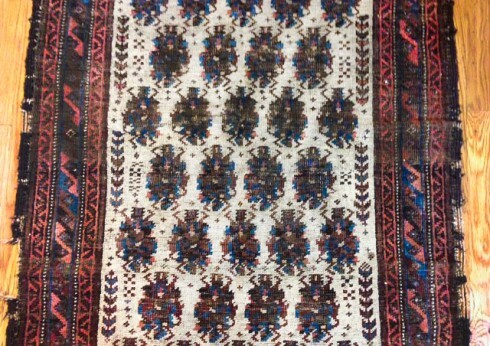 Balouchi carpets are commonly sold in the city of Mashhad, in the Iranian territory along the borders of Afghanistan and Turkmenistan, and home to some of the most noteworthy writers and artists in Iranian history. It is currently the second largest city in the country, boasting a population of over 2.5-million residents, and has long been a center of secular and religious education for the people of Iran. 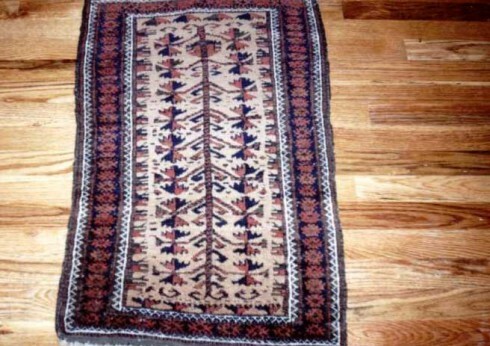 However, it is also prominent among other cities for its considerable regard for the handmade arts, chiefly attributed to the production and trade of expertly-crafted Persian rugs sold in various outlets within the metropolis. 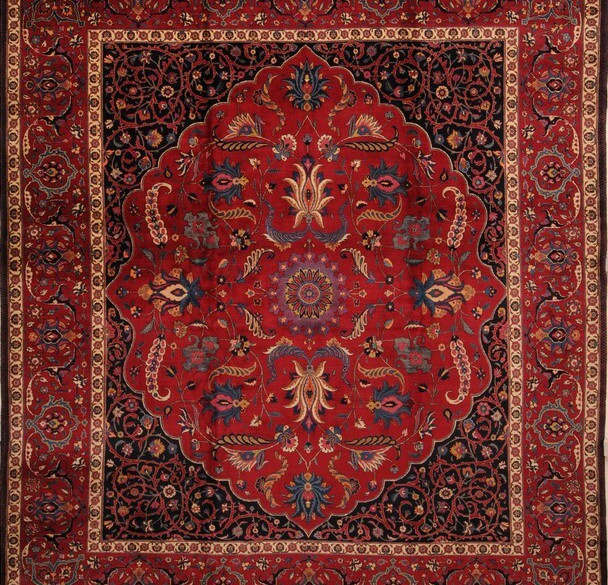 Though many of the surrounding towns and villages supply the Persian rug market in Mashhad, the Balouch carpet has remained singular in its ability to attract interest for its compatibility with a variety of room sizes and utilization in religious rituals. This has been to the benefit of the nomadic Balouchi villagers, who were forced to adapt the sizes of their looms during their long periods of travel in the region. Yet, it has not affected the quality of the workmanship, allowing weavers to produce some of the most exceptional carpets in the category through centuries of honing the artisanship that has been passed down to succeeding generations in the discipline. The lifestyle has also contributed to the designs being displayed on the carpets, principally intended to demonstrate their tribal way of life through animal figures, desert flowers and exceptional medallion motifs. 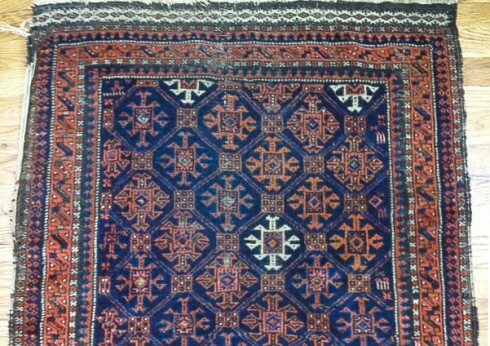 Of the medallions, most will feature a repeated pattern of greatly stylized camel’s foot, or pear-shaped decorations, surrounded by a tightly-knotted geometric border. Their threaded constitution can sometimes be found to be made from camel hair, but are more commonly fashioned in wool, with a cotton foundation serving as the warp. As a result, they can be suppler than many Oriental rugs, their superior wool arriving from the flocks watched over by the Balouchi people. The color palette is also simplistic in design, but equally as exquisite, ranging from a lesser variety of shades, and focused solely on those important to the Balouchi villagers rather than commercial viability. This has been to the delight of collectors and appreciators of the Balouch rug, who have come to adore the simplicity while stressing the quality of the manufacture. Common to their palette are dark reds and blues, contrasted by dashes of ivories, yellows and bright oranges, which are flattering to nearly any décor and avoid the busyness of other Oriental rugs.